Adult Learning Australia and Central Queensland University (CQU) recently partnered to conduct a one day forum ‘Building Rural and Regional Communities through Adult Education’. The forum was bookended by keynote addresses from Professor Barry Golding, ALA President and Professor Bronwyn Fredericks, Pro Vice Chancellor (Indigenous Engagement) and BMA Chair in Indigenous Engagement at CQU. Most Australians live in capital cities or in the coastal southeast. There are few big non-capital cities and many small towns. Queensland has many more people living in small towns and regional centres than other states. Queensland also has the most limited adult education system in Australia, and the least accessible TAFE and universities beyond the major cities. Transition of rural boys to tertiary study post-Year 12 is half that of rural girls. Transition of both genders is half as much as in capital cities. Regional university graduates tend to return to their region (as do most relocated city students). Embedding Indigenous content to reflect an inclusive curriculum. Developing entry & assessment processes to help identify the ‘best’ pathway for Indigenous students to access CQU. Developing a Widening Participation Project for learners who are not yet ready for the Tertiary Preparation Program. Building better communication and alignment between the Indigenous Tertiary Preparation program and the mainstream Tertiary Preparation Program (known as STEPS). The rest of the forum brought together people working in a diverse range of providers of community based informal and non-formal learning. We heard from presenters from the Queensland Men’s Sheds Association, as well as a local shed, the Capricornia Community Literacy Program, the Sabaya Bellydancing group and the Rockhampton Community Garden. We also heard a range of snapshots of new research into adult education. 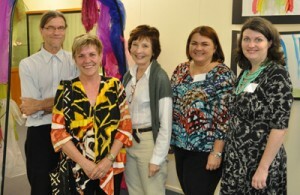 The forum started a powerful conversation about adult education in Rockhampton. We hope to do the same in some other regional centres.